Two floors of the human powered student building are dedicated to washing clothes and showering -- the individual student rooms have no bathrooms or washing machines. Showering and washing clothes both involve the use of hot water, which requires a lot of human power. To make it work, the student community applies low-tech and lifestyle changes. The energy use of hot showers mainly consists of heating the water. The Netherlands has little sun, which makes solar thermal boilers less suitable, especially during the times of the year when hot showers are most needed. Furthermore, a tower building has not enough roof space to provide hot water in this way. The use of wood fires to produce hot water is not possible either because of the strict fire and health regulations on campus, and because we aim to be self-sufficient in terms of energy production. Because the biogas plant only supplies enough thermal energy for cooking, there's no other option than to use human generated electricity to provide hot water for showering, a very energy-inefficient process. A seven minute shower using a low flow shower head (6 litres of water per minute) requires 1.5 kWh of electricity, assuming the temperature of the water is raised from 10°C to 40°C. Consequently, one student taking a seven minute shower involves a workforce of 15 students generating power for one hour, assuming each of them can produce 100 watts. The energy consumption of a shower can be lowered by one third through the use of a heat exchanger, which recovers waste heat from the shower drain. This brings the energy needs down to 1 kWh of electricity per 7-minute shower, for which we need "only" ten people generating power for an hour. Consequently, providing 750 students with one hot shower per day would require a workforce of 750 students generating power for 10 hours per day. In other words, we need the complete student population working all day to provide everyone with a hot shower. This makes no sense. How to solve this? First, hot showers are limited to 3 minutes, while the temperature is lowered to 37°C. This brings the energy use of a hot shower with heat exchanger down to 0.4 kWh. Consequently, four students need to work out for 1 hour to provide another student with a 3-minute hot shower. Although shorter and slightly cooler showers reduce energy consumption substantially, providing all 750 students with one hot shower per day would still require a workforce of 375 students -- half the population -- exercising for 8 hours per day. If the working half of the student population then decides to take a hot shower themselves, the freshly showered other half would need to produce power and get sweaty again. In other words, the student population ends up in a never ending spiral of showering and producing power for showering. This paradox is solved in several ways. First, people who provide energy for the hot showers of others are only allowed to take cold showers after their work shift. This is feasible, because these students would be so hot after their efforts that they can endure (and probably long for) a cold shower. Cold showering takes place in the receiving reservoir of the hydraulic system of the building, which is located on the communal energy producing floors. Second, students are only allowed to take a hot shower every three days. This means that we need energy for only 250 hot showers per day, which can be provided by a workforce of 125 students exercising 8 hours per day. In other words, one-sixth of the student population is needed to provide energy for daily showering. This doesn't mean that the students will smell bad. They are encouraged to do more quick washes at the sink, just like in the old days, or to take cold showers. Again, this is possible because all students will need to produce energy daily for a variety of reasons, raising their body temperature and lowering their need for hot showers. An additional difficulty is that most students want hot showers in the mornings and in the evenings, which could lead to large peak power demand. This is solved in two ways. First, the number of showers is limited to twenty for the whole building, distributed over two floors. This limits the maximum power use at any moment to 8 kW. Second, the generated energy is stored in the gravity batteries in the former elevator shafts, which means that energy production and energy use should not happen simultaneously. Finally, showering also requires energy to provide water under pressure. Piped water is pumped to the shower floors using energy from the communal power producing floors. However, to provide the additional pressure that's needed to operate the showers, every student needs to do a quick workout before taking a shower (hot or cold), pumping water into a small hydraulic accumulator that is located in between the showers. Because the number of showers is small, there's enough space left for doing the laundry. A modern energy efficient washing machine that can hold 9.5 kg of clothes uses roughly 500 watts of power. Based on guidelines for student communities, we need roughly 30 such washing machines for 750 students. Operating all these machines simultaneously would require 15 kW of electric power, which corresponds to the power production of roughly 150 students (assuming they are each producing 100W). Operating one washing machines requires five students generating power. However, this energy use can be lowered substantially. First of all, students are advised to wash their clothes with cold water. In recent years, manufacturers have found ways to create detergents that work very well in cold water. Furthermore, the students are advised to wear woolen clothing, which needs to be washed less often and preferably in cold water. Between 80 and 90% of the energy use of a washing machine is used to heat the water, which leaves roughly 75 watt of electric power for the mechanical movement of the machine. Washing clothes in cold water thus lowers the power requirements of the 30 washing machines from 15 kW to 2.2 kW, for which we need only 22 students. However, instead of generating electric power on the communal power floors and then distributing it to the washing machines, we make use of a direct mechanical power transmission and opted for a variety of human powered washing machines. This lowers energy use even further (we avoid substantial energy conversion losses in electric generators and motors) and makes it possible to power the machines on the spot. Consequently, students can generate the energy to wash their clothes themselves. However, the communal laundry space offers further possibilities for reducing energy use. Two or more students can fit their laundry into one machine, and shorten their power producing time. For washing really dirty clothes, students still have the option to use hot water. However, this will cost them extra power generation duty. Clothes drying, the biggest energy user in a laundry room, happens in the most traditional way: students hang their clothes to dry on racks fixed to their windows. This will give a Mediterranean touch to the Van Unnik student building. Heavy duty clothespins are provided to withstand the strong winds in the Netherlands. I made the calculation for 250 showers of 3 minutes a day (1642500 l - 51566,33 kWh). Although a sun collector will have almost no contribution in winter (nov, dec, jan, feb) I believe even a small installation can be a good support. An underdimensioned system will have the benefit of a higher delta T which means more solar energy can be harvested. - the potential energy of the waste water from the showers (0 - 60 l/minute per shower floor) can be recuperated with a micro water turbine. The rain water from the roof can be connected with this system to harvest more energy. Hot shower - use the sun to heat coils of pipe. In the general thread i read that small solar panels will be mounted on the exterior of the rooms on the south side of the building. Maybe there is a possibility of mounting the sun collectors on the exterior of the shower floor? This would eliminate the need to pump the water to the top floor and the hot water would be used where it is heated. The showers can be made more efficient by requiring a button push for every ten seconds of water, and having pre-set water temps (cold, barely-warm, very warm). When I was a kid, like 50 years ago, my YMCA had turn-dial water timers on the showers that only allowed 3 or 5 minutes before the water turned off. Of course you could turn it back on, but ... why can't I find these things on the internet? The best would be a push button (as are on some sinks) that only give 10 seconds of shower water at a time. There's no reason to run the water for the entire time that you're soaping up. This could be something mechanical that does not need any electricity to operate. I'm reading various websites and they all seem to think that it's reasonable to spend 5 to 8 minutes standing under hot running water. If you need hot water to relax, a communal spa-bath (after a quick shower rinse-off) would probably be much more efficient. 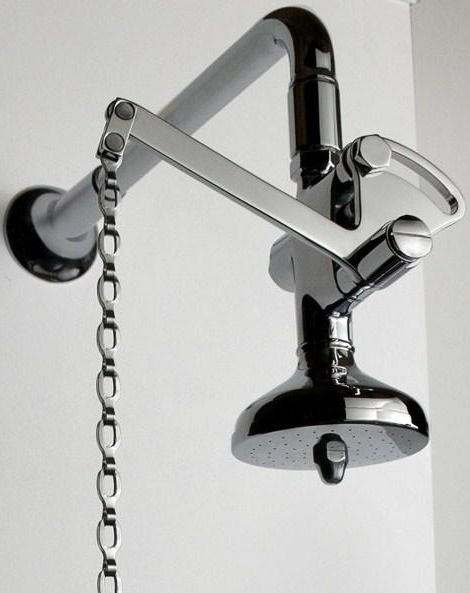 Maybe a shower head with pullchain? the rain water and waste water can not be mixed to generate the energy. The rain water can be used as shower water, which will lower the energy needed to pump water to higher shower levels but will also lower the flow of water to generate energy from. The surplus of rain water that can't be stored to use as shower water may have a flow rate that is too low for sustainable use of a micro water turbine. Thanks for all the ideas. We start improving the design once we have documented all floors. Why not adapt to a different method of showering? The Japanese use just enough water to get wet, then lather up without running water. Finally, they rinse off, and then there's a communal bath to soak in. This method can save a lot of water and thus a lot of heat. I read "the temperature is lowered to 37°C." Is that also the temperature of the water in the boiler? Any fear of legionalla? It is an optimal temperature for the bacteria to multiply... Normally they advise to heat it at least once a week to 60°C. At our home I only heat the boiler to 48°C and hadn't had any problem with legionella... so far. Do you use rain water for washing clothes ánd for personal hygiene? Do you take measures to eliminate bacteria? Do you have enough rainwater? How do you get water for cooking and drinking? Lots of questions, but it is an interesting experiment you are doing. Good luck!! Perhaps one could save water and yet give students a decent opportunity to clean themselves by offering hot wet towels. A pair of such towels may be enough to clean whole body, while the amount of water needed them is substantially smaller, hence allowing higher temperatures, thus avoiding the risk of contamination. The people in many traditional societies live without ever washing, just sometimes smearing themselves with fat or similar procedures. By the times my parents were kids, human smell was not considered as offensive. By the time my grandparents were kids, not having any skin and gut parasites was still considered unusual. So a real paradigm change will be to simply go back to the roots and admit dirt and smell and parasites as normal. Oh, and those who don't want to wash their hair may just shave their heads entirely - this is what many ancient civilizations, including ancient Egyptians, actually did.